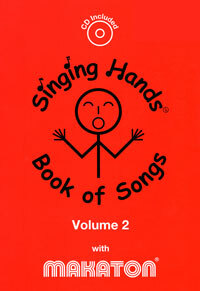 A review of Singing Hands Book of Songs and Song Time CD, Volumes 1 & 2 - produced by Suzanne Miell-Ingram and Tracy Upton in collaboration with the Makaton Vocabulary Development Project 2006. Singing Hands Book of Songs and Song Time CD set is a valuable resource for parents and professionals working with young children. The collection was developed by two parents whose children use Makaton signs to communicate. Both women very quickly saw the benefits of using signs with their children and wanted other parents and children to have access to signs through interactive, fun musical activities. In collaboration with the Makaton Vocabulary Development Project 2006, Suzanne Miell-Ingram and Tracy Upton have put together a collection of songs and rhyme activities that is now called 'Singing Hands'. The Book of Songs Volumes 1 & 2 each begin with a brief introduction about how the books came about and address issues such as 'What is Makaton? ', 'Who are the books for? ', 'Why sing with signs? ', and 'How to use these books'. In this way, each book can be used independently. Each song book then features 30 songs with words, signs and actions to use with your child. The accompanying CD features each of the songs in the book, so that you can sing along to become familiar with the music. For parents, this is a lovely collection of songs to share with your child. For practitioners, this resource can be used in the same way, or can be used to set up a music and movement session to use with babies, toddlers, and nursery children. Everything is clearly explained for 'Starter Songs' (e.g. hello/goodbye), 'Songs with text and additional information' (e.g. songs that have few signs, but may have other instructions), 'Songs with full sign illustrations' and 'Interpretations and Modifications' (interpretation of some words such as using the sign for 'cold' for 'shiver' in a song). Singing Hands is a fun and dynamic way to introduce families and babies to signs. Nursery songs are a natural way to learn language as they use age-appropriate language in a repetitive way so that children are getting lots of opportunities to see and hear new vocabulary. The Makaton Core Vocabulary is featured throughout the books and songs as well as additional age-appropriate key-words. Although the sets seem a bit expensive at £22.50 each, the robust quality of the books and the research and development that went into the Makaton Vocabulary Development project would justify the expenditure. Julie Hughes is at Down Syndrome Education International, Portsmouth, Hampshire, UK. For more information about Makaton, visit www.makaton.org. See www.bbc.co.uk/cbeebies and click on the link to Something Special for lots of free printouts and signed video clips.